1 pair LRL Lauren Jeans Co. olive green courdoroy pants. No unique stitching or pockets. Slim fit, straight leg, size 6. No identification tags. 1 silk camisole in eggshell with lighter beige lace trim in the shape of a bow/ribbon appliqued to bustline. Straps are thicker at front than back, each has a single white button sewn at back strap. No identification tags. 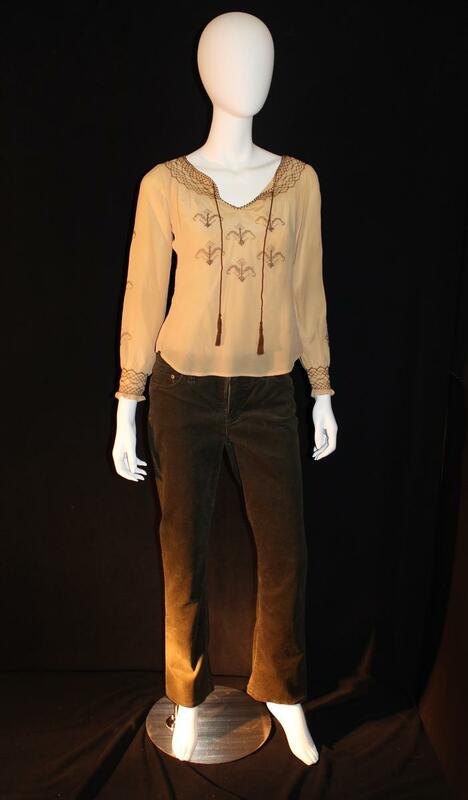 1 silk peasant blouse in champagne with stylized Fleur de Lys embroidery at chest and down length of outer sleeves. Contrast stitching along collar, neck, and sleeves. Darker brown string closure with tassles. No identification tags.